AH’’’’ , Autumn is passing so fast beside me like an arrow. There is a small temple in Anyang city(안양) where I live and sometimes used to go when I took a rest for the mind healing even though I’m not a Buddhist. In general in Korea, Buddhism is so familiar with the Korean from the child to adult generation that is so natural to go to the temple no matter how their religion is all round year. Moreover, most of temples are situated in the deep mountain and result in fine scenery at each season. With these reasons many people love the moment when visit that without any resist. These letters on the rock are the name of this temple(Yeombul-am염불암) which is the meaning of enchanting Buddhist's great words. There are so many temples having same name in this country because the word was borrowed from the Buddhism. As I heard, this temple was built in 1000 years ago. This bronze bell has used for alarming the time and gathering the public in case of special public ceremony. And they say that it also has a role of purification of mind filled with greed and complication. An image on the bronze of a flying fairy on her knees above lotus flower surrounded by clouds of flower,as I heard, is the typical style of ancient Silla-dynasty of Korea. The Daeungjeon(대웅전), the hall of great enlightenment, Grand Buddhist sanctuary, showed the dominant colors with the ornate Dancheong(단청) like as usual type in Korean temple. Dancheong is the traditional multicolored paintwork on wooden buildings, especially in the temple or old palaces. It has five colors only;blue, red, yellow, white, black. How amazing it is to express just by using such simple five colors only! It has multi purpose of aesthetic value, preventing of wood decay, protecting from insects. 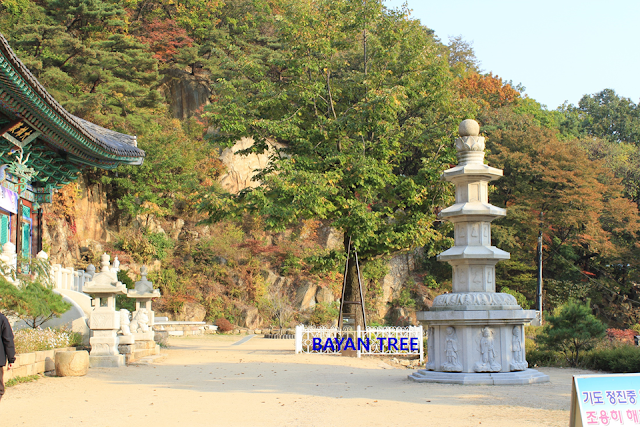 On the front yard there was a 600 years old banyan tree which is symbolic tree of Buddhism since Goryeo-dynasty of Korea. It was true in the Buddhism that they has regard as symbolic tree because Buddha got a great enlightenment under this tree. People believe this Buddha will relieve mankind with his big mercy. It is true that this temple has deep history over 1000 years. Maybe the most charming point is the smiling gentle statue Buddha like the uncle living next door at the rear side.